Canon DSLR cameras have made a bit of a name for themselves as astro imaging cameras and for good reason. Canon started the drive for very affordable Digital Single Lens Reflex Cameras with the release of their 300D camera in August 2003. This very reasonably priced camera took the amateur market by storm and was soon adopted by astro-imagers as the astro camera of choice for wide field images. The 300D was loosely based on the 10D but the cameras firmware was cobbled to reduce its feature set to justify the much lower price than the 10D. However, the arrival of the 350D eighteen months later put right much of the loss of features. One thing that the 350D still retained though was the rather savage built-in Infra Red (IR) filter required to achieve natural colour images in normal daytime use. Unfortunately this IR filter also attenuates the red portion of the light spectrum and in particular that region of the spectrum between deep red and infra red known as Hydrogen Alpha (Ha). Unfortunately many of the most beautiful objects in the night sky emit light in the Ha region and because of this filter they are very difficult to image. Until recently, my main imaging camera was an SXVF-H9C astro CCD camera which takes excellent images but because of its relatively small sensor (1380 x 1024 pixels) it has a fairly small field of view for a given telescope/lens. I particularly enjoy imaging nebulae but many of these are too large to capture even using my CCD camera and 80mm Refractor so I needed a camera with a larger sensor. Unfortunately, these large sensor cameras can be prohibitively expensive but a small industry has built up around modifying these cameras for astro-imaging use by removing the standard filter and replacing it with a new one that passes up to 98% of the Ha emissions thus making it much easier to image these emission objects. I decided to try one of these modified DSLR cameras with a Baader Astro Conversion Filter (ACF) installed and the following is a mini report. Having charged the supplied Lithium Ion battery, I was keen to take a test image to see what effect the new filter was going to have on a standard daytime image. Image 1 was taken with a standard 350D and Image 2 was taken with the new filter modified camera. It was immediately obvious that the new ACF filter had had a dramatic effect on the colour balance. Unfortunately the weather on the day that the camera arrived was awful but this gave me the opportunity to amass a set of BIAS and DARK frames for use in processing my images when the weather improved. I specifically wanted to use MaximDL to calibrate and de-Bayer my images as subtracting Bias, Dark and Flat frames from images is best done before colour conversion takes place. I spent some time the following day adjusting the parameters of the RGB conversion set-up screen to obtain realistic colours in a daytime image. The biggest stumbling block was sorting out the X and Y offsets but having got those sorted, I was able to calibrate and colour convert my daytime image to give a good colour balance. This seemed to be a good start point for processing my astro-images. Image 3 is a test image colour converted in MaximDL from the raw data. 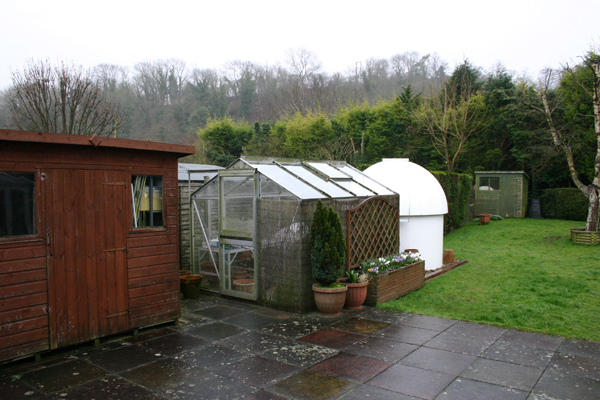 This image formed the basis for colour conversion of the test astro-image. Later that evening, there was a break in the weather and I was able to try out the camera on a celestial object. 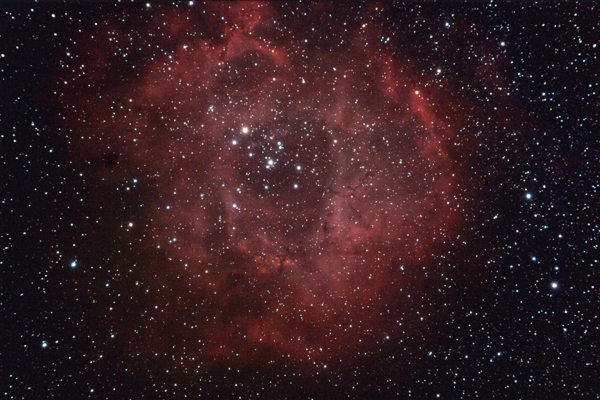 One object that I particularly wanted to try was the Rosette Nebula. This is a surprisingly large nebula so a large sensor (or very short focal length lens) is required to image it - an ideal subject for the 350D and my 80mm ED Refractor. I took 8 X 300 second subs. at ISO 400. I had hoped to take quite a few more subs. but the clouds rolled in and later on there was an amazing storm. Image 4 is the first light image for the camera and having subtracted the Dark and BIAS frames I feel it acquitted itself rather well for a first light image! The large field of view afforded by this camera and the wisely chosen replacement filter make this a very affordable and versatile piece of astronomical equipment that will allow me to take a wider (ooops pun!) choice of celestial objects yet it can still be used to take ordinary photographs using a custom white balance or using suitable post processing techniques as shown above. 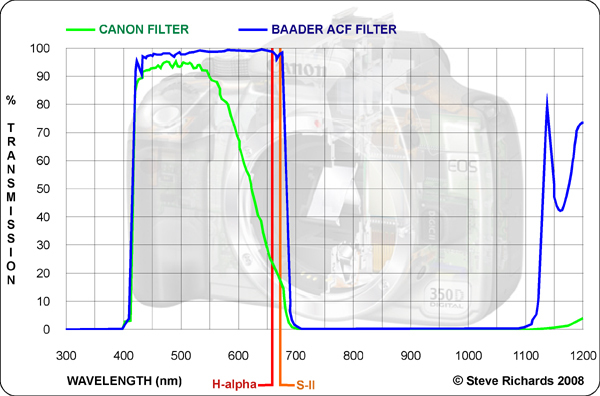 The Baader ACF filter has been specifically designed for astro-photography use and the following graph explains why it so good for the purpose in comparison with the standard filter supplied with the camera. As can be seen in Image 5, the unwanted IR portion of the spectrum above 700 nanometres wavelength is heavily attenuated on both filters but the Canon filter only passes just over 20% of the Ha light which is a real problem for capturing emission nebulae! The Baader ACF filter resolves this issue by passing 98% of the Ha light and it also passes SII making the camera potential suitable for some interesting narrowband imaging. 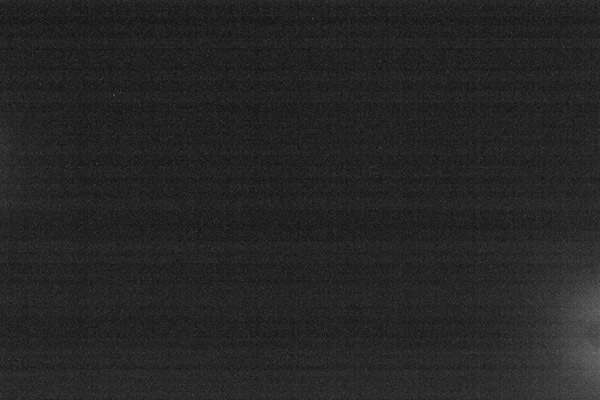 In common with all other DSLR cameras, the 350D does not have Peltier cooling which means that the sensor generates more random noise than a typical astro-CCD camera and additionally, there is some amplifier glow generated in the bottom right hand corner of the image on long exposure frames as can be seen in Image 6. 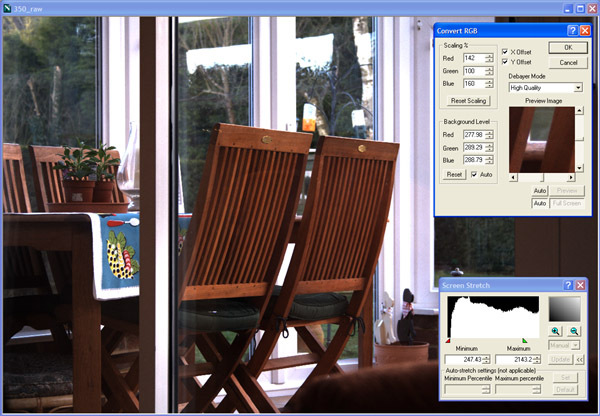 Additionally, the 350D produces some fixed pattern noise which becomes evident in very stretched images. However, these problems can largely be resolved by the careful use of dark frames and their subsequent subtraction from the main image. Additional improvements to the image can be achieved by subtracting a BIAS frame to compensate for pixel-specific offsets in the CMOS chip and camera electronics. 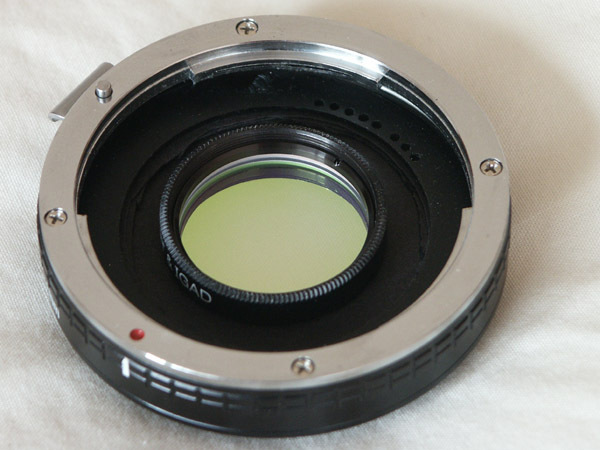 Because the sensor is relatively large, vignetting starts to become a problem and although it is most desirable to remove this directly from the light path by using suitable components, this is not easy with typical amateur equipment. The problem can be exacerbated if additional filters, for example a Light Pollution filter is included in the light path. However, subtracting a suitable FLAT frame resolves this issue and has the advantage of removing the effects of dust fragments on the various components - including the sensor - in the light path too. My image of the Rosette Nebula was taken with an IDAS LP filter in line using a home designed and built filter holder -Image 7. This list of actions sounds horrendous but is the same process that I routinely use with my astro-CCD camera. In reality, I automate the process by using a stock of BIAS and DARK frames that I have combined using averaging as this has the advantage of removing any extremes from the calibration frames. I take my FLAT frames at the end of the imaging session before I touch the camera as it is important that these are taken with the camera in exactly the same orientation as that used for the image frames themselves. On the occasions that I am unable to take FLATS , I use an excellent PhotoShop plugin by Russell Croman called Gradient Exterminator. I have produced a cut down version of the specification sheet for this camera with the emphasis on its astro credentials. This data sheet can be found by clicking here. The Baader ACF filter transforms the Canon 350D into an excellent wide field astro-imaging camera with good sensitivity to Ha at a very competitive price in comparison with a similarly sized sensor installed in a custom Astro-CCD camera, provided that you accept that it will generate more sensor noise because of the lack of cooling which will require careful processing to alleviate.